If you've just got a new Windows Phone 7 phone from Samsung, HTC, or LG, then congratulations, you are taking a brave step into an exciting new world that is Microsoft's latest operating system. But with a new OS there are bound to be plenty of questions. How do I do that? What's the best way of doing this? Where does that feature live? Don't panic, we hear you loud and clear, as we've been playing with the new software to find out all those tips and tricks so you don't need to worry. If you're new to the OS or thinking about getting a phone with it on, check out our whopping list of 72 tips and tricks to get you started. Press and hold the Windows key at the bottom of your screen and you can start talking to your phone. Try saying "Open Calendar", to see what we mean. When you are in the long applications list on your phone pressing on an icon and holding brings up a contextual menu that gives you a series of options, one of which is "pin to start". Press on this option and the app will be shown on the Start screen. No it's not just about adding apps to the start page, but people too. Find them in your contacts book, click on the "pin" icon, and they'll be added to your Start page so you can speed dial them whenever you need. Adding a new app or tile to the Start screen will place it right at the bottom. If you want it to be elsewhere, press and hold on the tile in question and then you are free to move it up and down and rearrange your tiles to best suit your needs. You like the app, but you don't really want it on your Start screen anymore. No worries. Hold your finger on the tile in question for a couple of seconds and when it highlights press the no pin icon in the top right-hand corner. You've tried it and you don't like it. No problem. Head over to the menu list and press down on the app in question until you get the contextual menu. Select uninstall and you're done. You really love the new app you've downloaded, so much so that you want to rate and review it so anyone else interested knows whether it's any good or not. 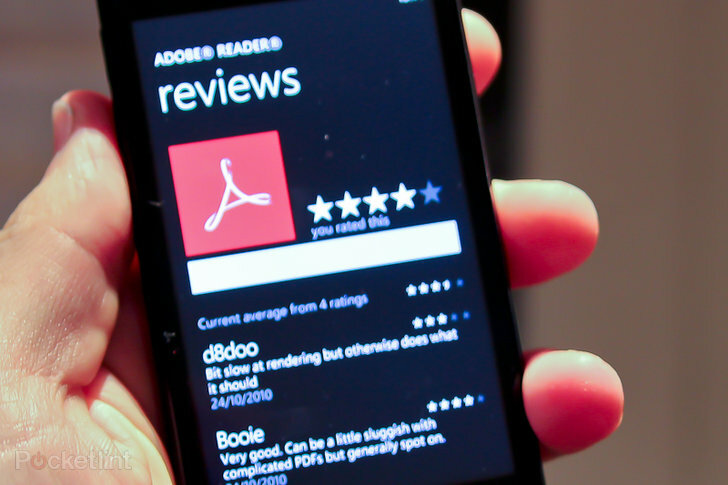 With Windows Phone 7 you don't have to wait until you delete it to rate it, you can rate and review it at any time. Press and hold down on the app in question until that contextual menu appears and then choose "Rate and review". It will bring up another page allowing you to have your say and give it a rating out of five. Easy peasy. If you've got your Windows Phone 7 phone from Vodafone the theme is going to be all red, O2 is dishing out blue themes and Orange, orange ones. An all red themed phone might be a bit much (we hear you), but fret not as you can change the colour of the tiles and other features in the Setting area. Zip on over to the menu list, select Settings, and then Theme. Here you can choose the colour of the background and the accent colour. Background options are "Black" or "White" while you'll get nine accent colours to pick from. Lime, anyone? 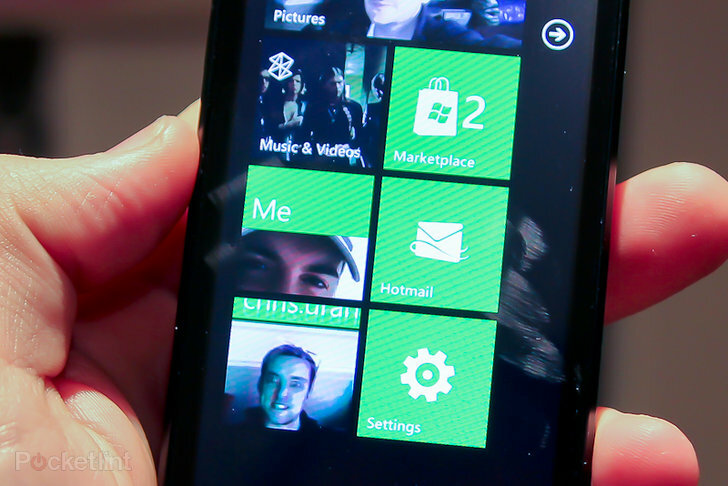 Windows Phone 7 is built around the idea of panoramic tiles that you swipe to reveal more content off screen. It's always worth seeing if you can swipe to the left as there might be more stuff waiting to be revealed. 10. What are the dots? Whenever you see three dots at the bottom of the screen, that's a menu for more options. In photo playback for example, it will give you the options to delete the image or perform a quick upload. While the three dots will get you to the same thing, holding down your finger for longer than a second normally brings you the menu too. Try it in photos to see what we mean. Click, click, click, click. Yep, it's annoying isn't it? Great thing is you can turn off the noise Windows Phone 7 makes when you tap on your keyboard in the ringtones and sounds area within settings. want to know when you've received an email? 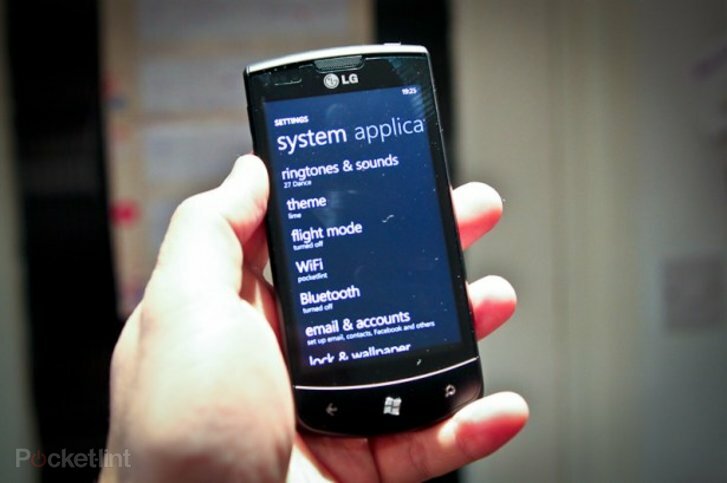 Probably not, but if you do Windows Phone 7 lets you set a dedicated sound so you know when "You've got mail". 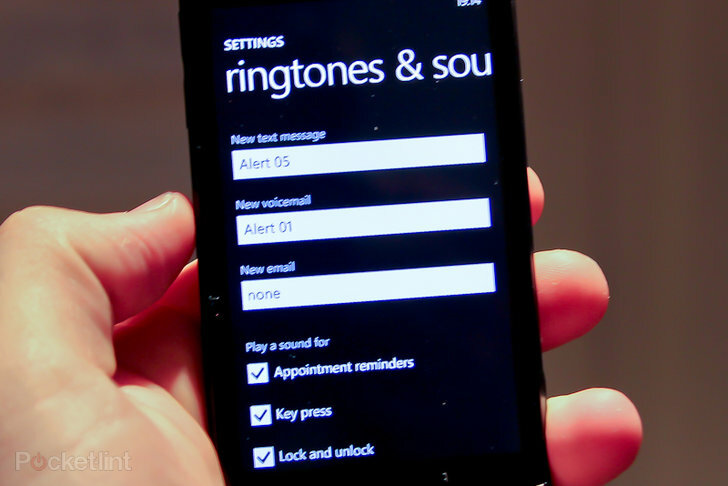 Settings, Ringtones & Sounds, and choose sound. Settings, Ringtones & Sounds, Ringtone. There are 30 to choose from and you can try them before you select it; just make sure you aren't on a train. Unless you are happy to surf on your 3G connection you'll probably want to turn on Wi-Fi at some point. Wi-Fi settings can be found in the Settings area, and you can have the phone notify you of when new networks are found or not. Selecting the network you want to join prompts you for a password, if there is one, and you can go deeper and adjust specific settings if that's your thing. Setting up an email account in Windows Phone 7 is really easy regardless of what email service you use. There is support for Windows Live, Outlook, Vodafone E-M@ail, Yahoo! Mail, Google, Facebook, as well as other accounts if you use someone different; this varies slightly from network to network. Select the one you want, punch in your email address and password and for most of them that's it. A new tile will be created on your Start screen and within a couple of seconds you should be getting email to your phone. In Settings, Emails, and then Google email, there is an option to sync your email, your contacts, and your calendar. Select which one you want to add to your phone. If you or your company use a Google Apps account you will have to enable Mobile mail for the system to work. Log in to your Google Apps dashboard, go to Service settings, choose Mobile and make sure "Enable Google Sync" is ticked. Once that's done it should work like a charm. While most of the interface is two colours you can change the image on the very first page you see when you turn the device on. Here you get to choose between a selection of stock images from Microsoft or ones you've taken. Search the images you've got, select the image that you want and then select the area of that picture you want to crop. Press the tick and you're done. You've just selected a new wallpaper for your lock screen. Well done you. If you are able to connect up your phone to your email, Facebook and other gems, we would highly recommend setting a password to protect it all. Like the iPhone you can set a four digit password to lock anyone out. Setting the password means that you lose the "never" option in the screen time-out options, however it does mean that if you forget to lock your phone, it will do it for you. Want your phone to lock automatically so you don't phone people from your pocket? Of course you do. 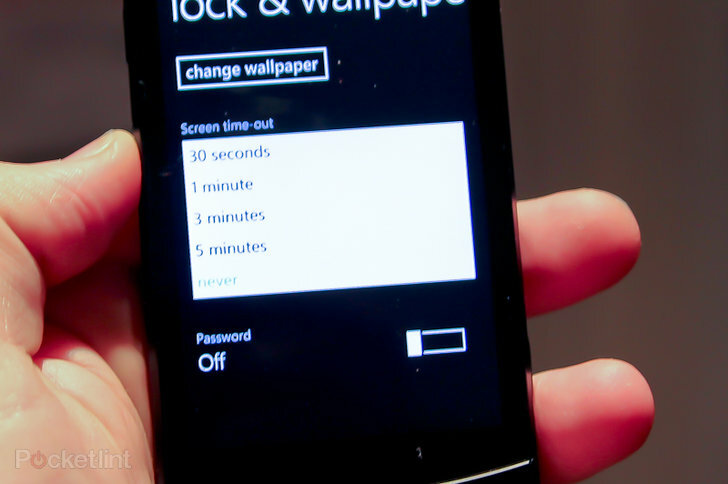 Jump into Settings, Lock & Wallpaper, and choose how long you want your Windows Phone 7 handset to go before locking down. You can choose 30 seconds, 1 minute, 3 minutes, 5 minutes, or never. Location services are great, but they will eat your battery. If you aren't fussed about geotagging your photos or finding out where you are on Bing maps, nip into the Location option in Settings and slide that toggle to the left. No more Big Brother for you. If you just want to turn off geotagging you can do that too. Go to Settings, Applications, Pictures & Camera, and then toggle the "include location (GPS) information in pictures you take", to the Off position. Surfing the Internet is an expensive pass time when you are in another country, as is checking Twitter or Facebook. Luckily you can turn off data roaming at the flick of a switch. Settings, Mobile Network is the place to go. There is always someone that will want to turn off 3G network support, presumably to save battery, and if that's you you'll need to head to the Settings, Mobile Network page to do just that. While you'll save battery don't expect those web pages you are surfing to load anytime soon. On-screen keyboards are great, but they are prone to helping you make mistakes when typing. Realising this might be the case, Microsoft has added an option to "Correct misspelt words". It's on as default, but if you find this idea annoying, fret not, you can turn it off. You'll find the option in Settings, Keyboard. Hit the spacebar twice in an email and you'll get a full stop automatically appear. Don't want that to happen? Settings, Keyboard is your friend. 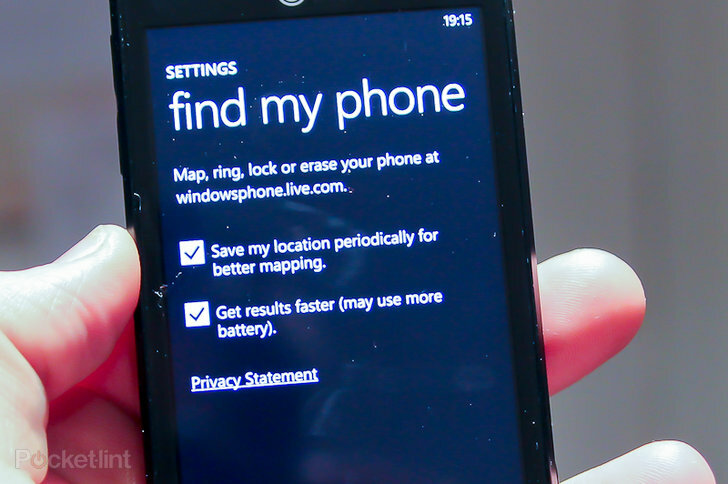 Windows Phone 7 comes with some really natty features, one of them being the, "Find my Phone" feature that lets you find your phone again if you've lost it or had it stolen. Trouble is, it's not on as default so you've got to do that yourself if you want to take advantage of the feature. In the Settings, Find my phone page, you can opt to have the phone save your location periodically for better mapping and to get results faster. Guess what, you don't need to worry about that, the phone will automatically do it for you when there is an update available. Wondering how many "bars" you've got, or what the Wi-Fi strength is like? Simply tap at the top of any screen and that information will appear. Yes there is a dedicated Facebook app, but Facebook is also well and truly integrated into the phone. If you've got a Facebook account, go to Settings, Email & Accounts; log in, contacts, pictures and other gems are then populated across and around your phone. It's always a good to keep a backup of your pictures, and Windows Phone 7 comes with SkyDrive which lets you do just that. In steps the auto upload to SkyDrive option. If you got confused the first time it asked you when you went into the pictures area, don't panic, you can re-enable it via the Applications page hidden within Settings. Go to Settings, swipe to the left and then scroll down to Pictures & Camera. In there you'll find the option to set the Auto Upload feature on. Following the instructions in tip 31 there is an extra option to enable quick uploads to Facebook. Now when you view the picture you'll have an "Upload to Facebook" option. Press the button and into the ether the picture goes. There are plenty of sites on the Internet that have a mobile version of their website so you can browse quicker when you are out and about on a slow connection. Trouble is, sometimes you don't want the mobile site and not the desktop site. 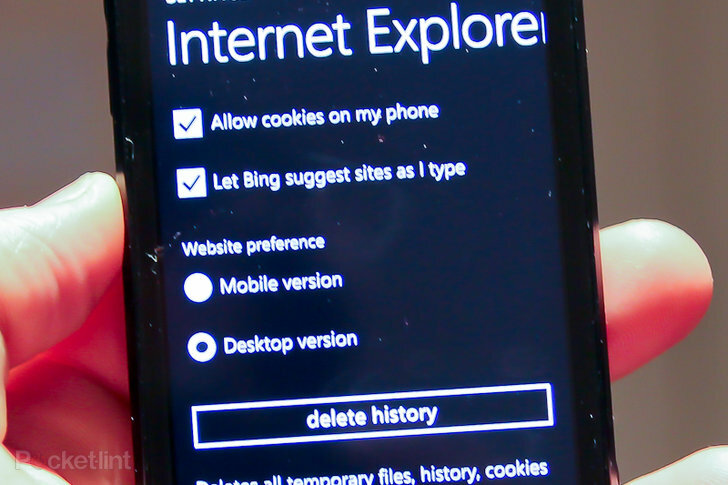 Go to Settings, Applications, Internet Explorer and you can change how you want your Windows Phone 7 browser to act when it goes to a web-page. Want to know if the text message you've sent got there? You can turn on SMS delivery confirmation by going to Settings, swipe to Applications, Messaging and flicking the On toggle. Adding your Facebook mates to your People hub is one thing, but if you aren't really that fussed about contacting them on a regular basis from your contacts book, then you can rid yourself of them in a couple of steps. Settings, swipe to Applications, People and then choose to "Show all my Facebook friends" in your contacts or "Only add Facebook information to existing contacts". Always travelling, always forgetting to add the 0044 to your calls back to the UK? Then go in to Settings, swipe to Applications, choose Phone and then set International assist to On. Turning it on will help automatically correct some of the common mistakes while dialling international or dialling while abroad. Been to a website that you perhaps shouldn't have? Trying to cover your tracks? Well the delete search history option is found in Settings, Applications, Search. Click the big "Delete history" button and your tracks are covered. You can do the same to your entire Internet Explorer history in Applications, Internet Explorer. We know you love Pocket-lint, that's why you are reading this, but you can pin a link to our website by going to Internet Explorer, visiting the site, and then hitting those three dots we told you about in tip 8. That brings up a menu and in that menu are the words "pin to start", press it and you'll get a new tile on your start page. 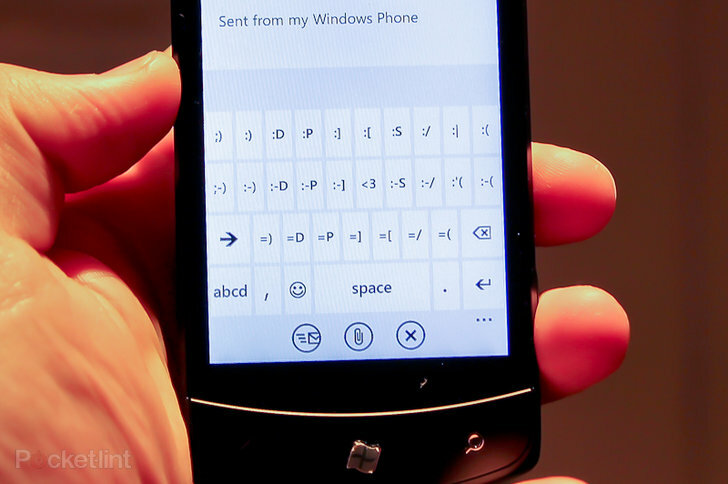 Internet Explorer on Windows Phone 7 has a "find" feature that allows you to find a word on a page. Very Handy. Go to the web-page in question, press on the three dots, click on "find on page" and then type in the word you are looking for. You can then scroll through those instances on the site. To get back to the page without the search words highlighted, just press the back button. Just like tabbed browsing on your desktop computer, Windows Phone 7 Internet Explorer lets you do tabbed browsing on your phone. At the bottom of the page is a circle with what looks like two pieces of paper in it. Press on that icon and you'll be able to load up more pages. When you have more than one it will show a number. That correlates to the number of pages you have running. To get rid of the address bar and the icons at the bottom turn your phone landscape. The software automatically switches with you giving you more space to read the site. Like a page, and want to send it to a friend; press the three dots in Internet Explorer, select Share page and then you choose how you want to share it - Messaging, Hotmail, Google Mail, etc. Load up the keyboard in Internet Explorer and to save you valuable seconds you get a .com button for websites. But what if you are going to a .co.uk? Well press and hold the .com button and up pops .co.uk, .org. and .edu. Double tap the shift key to turn it on, double tap it again to turn it off. Press and hold the letter on the keyboard in question to get the different characters associated with that letter. The keyboard is fairly comprehensive and simple to use, but it can't display all the symbols you might want at the same time. If that's the case press the "more" arrow to the left of the screen to reveal more keyboard options. Another keyboard shortcut that works when you are typing an email. Press on the smiley face and you get all the :) :( :-] faces you can imagine without having to type them out. It's quick, it's simple, and yes your mates will either love you for it or think you are a dork. Easy, press the search button on the bottom of the phone that looks like a magnifying glass. Pressing it once lets you search the application you are in, pressing it twice lets you search the web via Bing. It sounds silly right, but it caught us out first time so we suspect it will catch you out too. Forwarding an email is actually found in the icon with a small envelope and an arrow that looks like you are replying at the bottom of the screen. Annoyed by that "sent from my iPhone" message you always get from your mates, and don't feel you need to brand your messages with the Windows Phone 7 love - don't panic, you can turn it off. In Mail press the three dots, select Settings, and then either turn off email signature or change it to whatever you want - maybe "Sent from my iPhone". Press and hold down on the email you want gone and a contextual menu will appear on screen allowing to delete it from your phone. 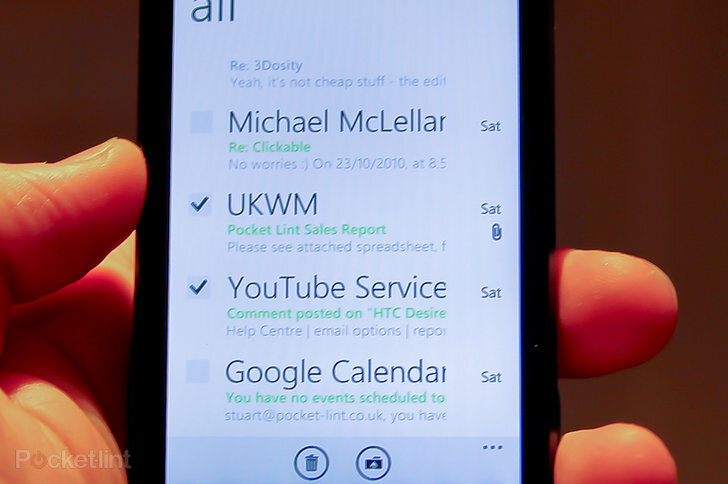 Email on Windows Phone 7 isn't just about seeing the emails coming in, but about seeing what you've read, what you haven't read, what's flagged and what's urgent. You can flag emails to appear in the flagged list by pressing and holding on the email you want to flag and then selecting "set flag" from the menu that appears. In your email queue tap on the far left of the screen. Doing so will slide the email queue to the right slightly, and you'll now see that all the emails have the option to be ticked. Once you've ticked the ones you want gone press the rubbish bin icon at the bottom. One of the annoyances of email on the iPhone is that you can't mark all "read", here you can. Follow the commands in tip 54 and then press on those three dots. You can then set "Mark as read", hey presto you've now read those emails. 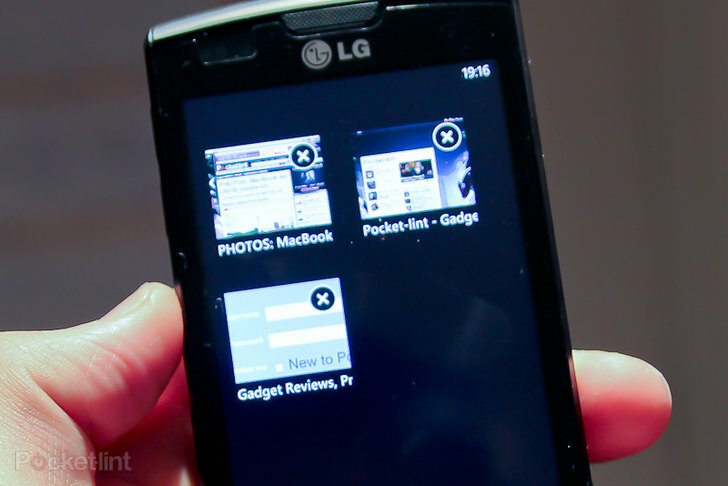 So you've given it your best shot, you really did try to like Windows Phone 7, but you just don't. All the operators in the UK have a cooling off period that let return the phone, as long as it is in good condition. If that's the case you'll want to reset the handset so none of your details are on it. If you need to do that go to Settings, About, and hit the "reset your phone" box at the bottom of the page. Windows Phone 7 allows you to show your number to everyone as default, but if you don't like the sound of that you can turn the feature off to anyone not in your contacts, or to everyone regardless. Go into Settings, swipe to Applications, choose Phone and then set the "Show my Caller ID to" to the setting you want: Everyone, no one, and my contacts. If you're worried about having to scroll through all those names in your contacts book, don't. Pressing any of the letters (a, b,c...) will bring up an alphabet so you can jump straight to the starting letter of the person you are looking for. S for Stuart, obviously. If you've got your contacts book filled with Facebook, Gmail and Hotmail, maybe even your work email, then chances are some of your core friends are going to be in your contacts book a couple of times. Windows Phone 7 is clever enough to "link" these contacts so they are shown under a single page. If it misses some, go into People, select a contact and then press the "chain" icon at the bottom of the page. You can then link further contacts to this page if you wish. There isn't a dedicated MMS area in Windows Phone 7. Instead you just attach images to a standard text message and it does the rest for you. If you want to send an MMS go to the Messaging tile on the Start page. 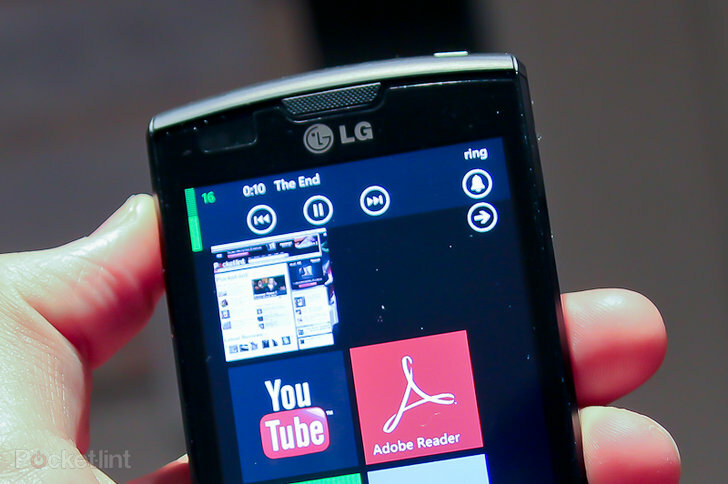 You don't need to be in the Zune player to access the music on Windows Phone 7. Tap the volume buttons on the side of your phone and down pops a miniature player window that gives you access to the play and skip buttons. If you've not got your headphones in, the music will start playing through the phone's speakers. Go into the Zune music player, press and hold the skip track icon at the bottom of the screen. Rather than skipping to the next track it will fast forward within the one you are in. This one is hidden within the player. Tap on the album cover and it reveals two controls, a repeat and a shuffle icon. It's like you've found a special secret. Get more out of the Xbox live connectivity by downloading Xbox LIVE extras. It's a free download from the Marketplace and lets you have more access to your profile, letting you change your avatar's style while you're bored on the bus. You're impatient we know, but at least you can check the state of your download and how it's progressing. Once you've clicked to install the new app on your phone you can then see how it's doing by clicking on the "check install" button. Watch that progress bar move, baby! Put in your old SIM card, Go to People, tap and hold near the top of the screen and then select "import SIM contacts". Windows Phone 7 lets you bring in another person to your call at the tap of a button. Dial your first friend, then when you have them on that call, tap the down arrow displayed on screen, then press "Add call" and phone another friend. Now tap "Merge calls" and the word conference appears near the top to show you that you are on a conference call. The reason you've got a picture of youself staring out at you on your start page, is because it's your phone, and you've paired your Facebook, Windows Live and other social networking details with the phone. If you click on the pic, you can quickly share messages with your social world. Clever huh? If your phone starts ringing in a meeting, and that's a bad thing, just press the power button. It silences the ringer immediately. Yes, you could just phone someone and get them to read back the number, but that shows you don't know your new number - embarrassing right? To save you from that moment you can nip into Settings, swipe to Applications, then select Phone, and it should be there. If it's not, then you've got to make that phone call.